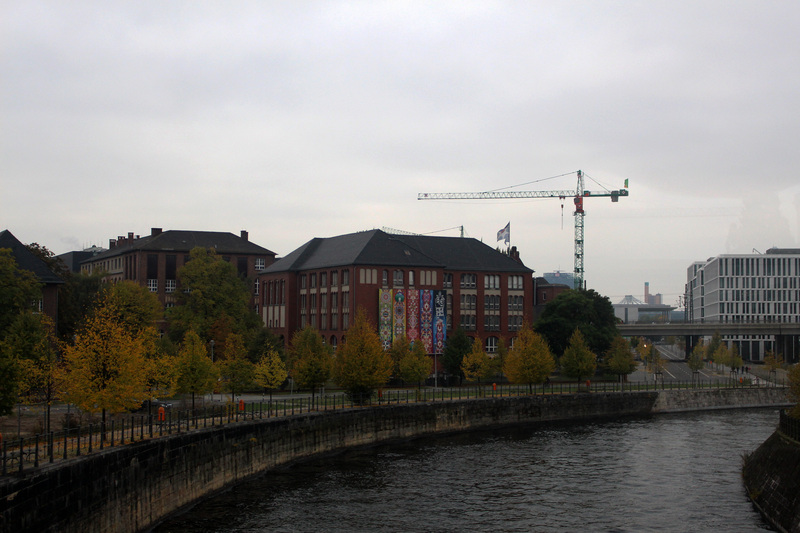 While in Hamburg, we learned that Berlin was only a 90-minute train trip away. 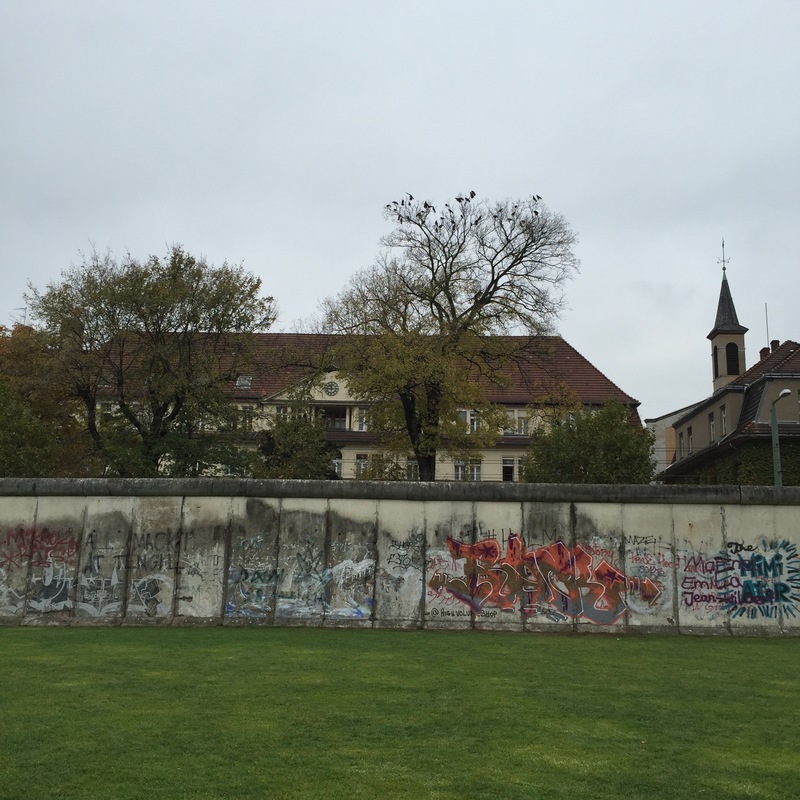 Being so close, we decided we couldn’t pass up the opportunity to visit another German city—and one so mired in history at that. We booked last-minute tickets which set us back about €200, but it was completely worth it. Early Sunday morning we set off from our hotel. The streets were dark, damp and pretty much empty as we made our way to the Hauptbahnhof. We originally thought about taking the subway to the central station, but were alerted by the only other person up at such an early hour that the train wasn’t running yet (at least that’s what I understood from his “no train”). Nice guy to give us a heads up. Eventually we made it to the station and grabbed a couple of smoothies as breakfast while we waited for our train. Unsurprisingly it was very prompt, arriving at exactly 7:06 a.m.
Once we settled into our seats on the train we were able to relax and even doze off a little bit, the movement of the train lulling us to sleep. Even the noisy travelers a few seats away were unsuccessful from keeping us from little naps. The Hauptbahnhoff station in Berlin was quite a bit larger than the one in Hamburg (it’s considered the biggest train station in Europe according to Rail Europe) and the wind that hit us as soon as we stepped off the train was even colder. We went in search of the Tourism office as soon as we got to the station and booked tickets for the City Sightseeing Berlin hop on-hop off bus. We figured this would be the best way for us to see the city in the limited time we had. Tickets in hand and a little time to kill, we went in search of bathrooms and something to eat. We soon learned we needed to pay to get into the bathrooms in the station. For 1€, you can do your business and get a .50 rebate ticket to use for future bathroom trips or at one of the participating shops in the train station. What a deal. 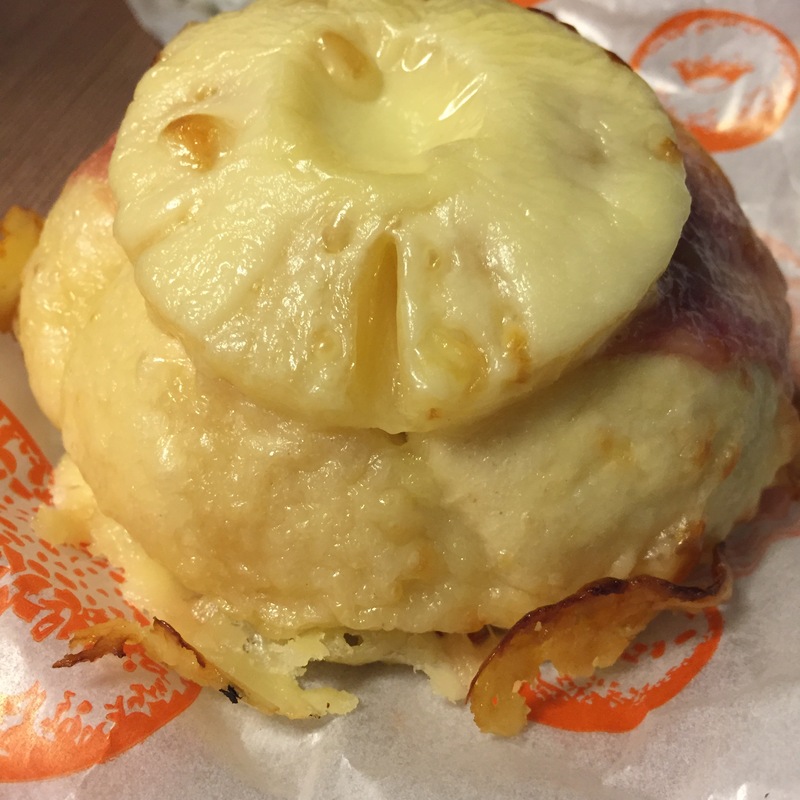 After relieving ourselves and grabbing a couple of tasty treats (including this deliciously cheesy bun), we headed out to catch our bus. 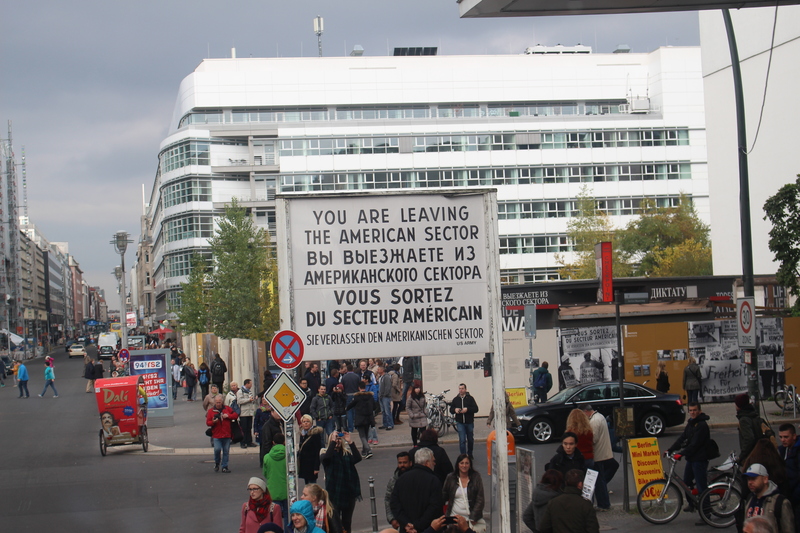 Our first stop was the Berlin Wall Memorial (Gedenkstätte Berliner Mauer) and visitor center. 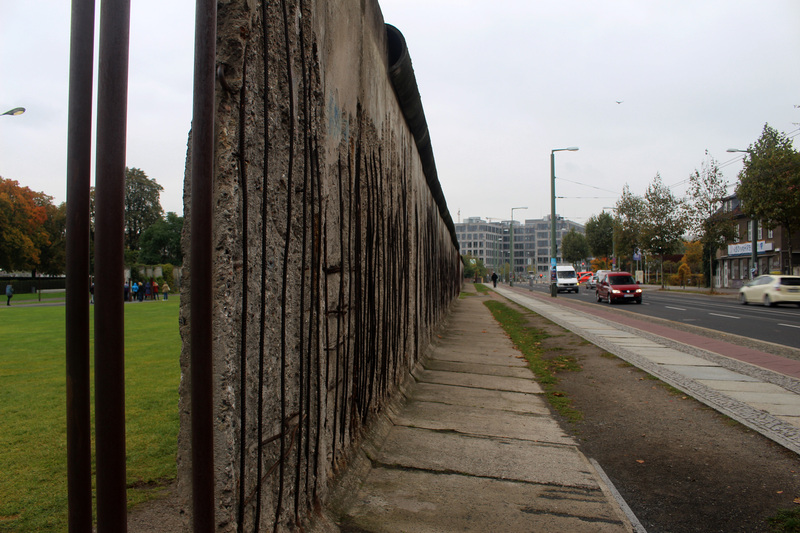 The 1.4Km stretch of wall is on Bernaur Strasse and the preserved grounds behind provide an impression of how the border fortifications were developed until the end of the 1980s. The day was grey and quiet and a flock of crows screeched from a tree across the street, giving the already solemn memorial an even eerier feel. 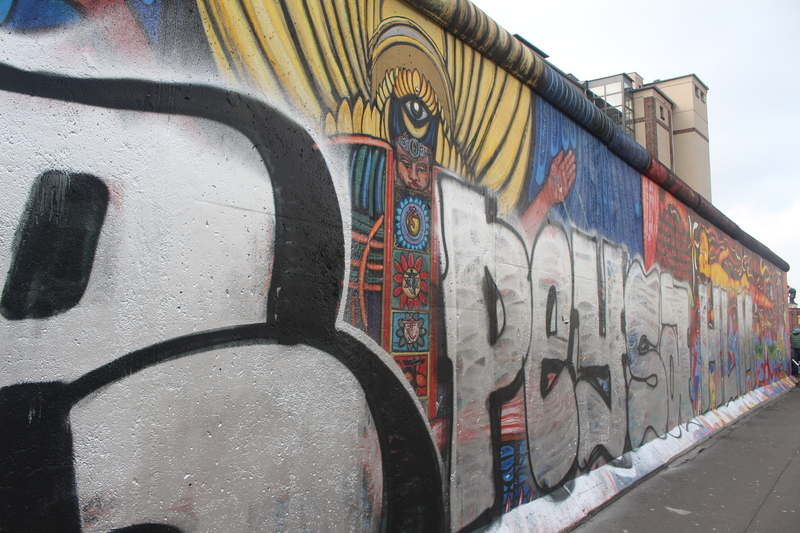 The Berlin Wall, built in the years following Germany’s division between the Western Allies and Soviet Russia following WWII, enclosed West Germany from August 13, 1961 to November 9, 1989. 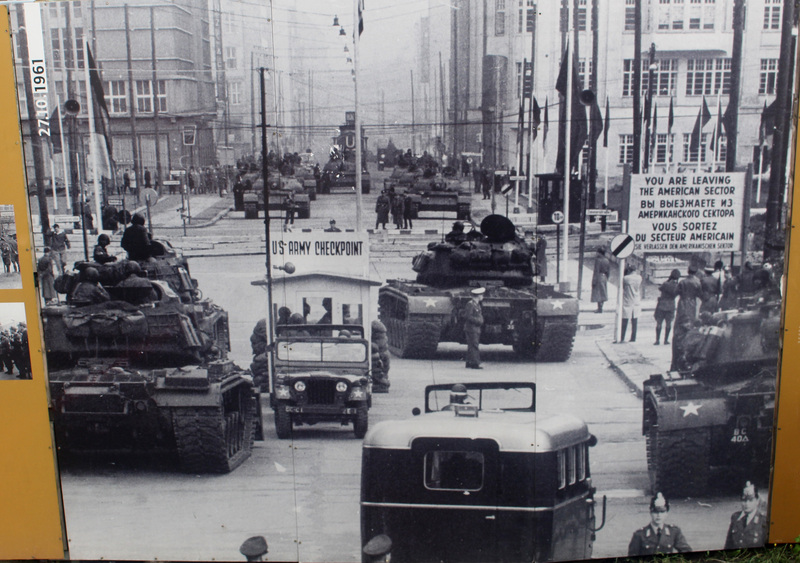 It was meant to prevent East Germans from fleeing to the non-communist, western part of the city and country. The wall cut straight through the city, cutting off roads and anything else in its way. 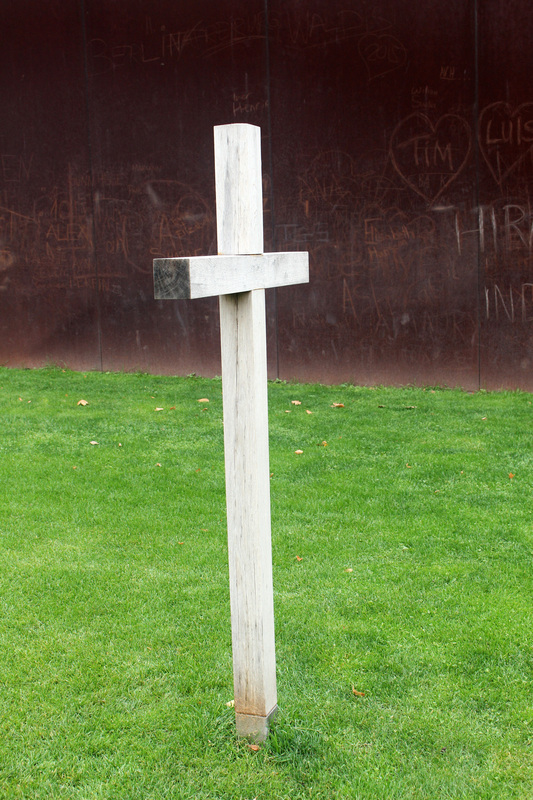 In the case of the memorial location, a cemetery had to be relocated for the construction of the wall there. The memorial and visitors center were both interesting and gave an eye-opening picture of the impact of the wall and those who lost their lives in protest of it. 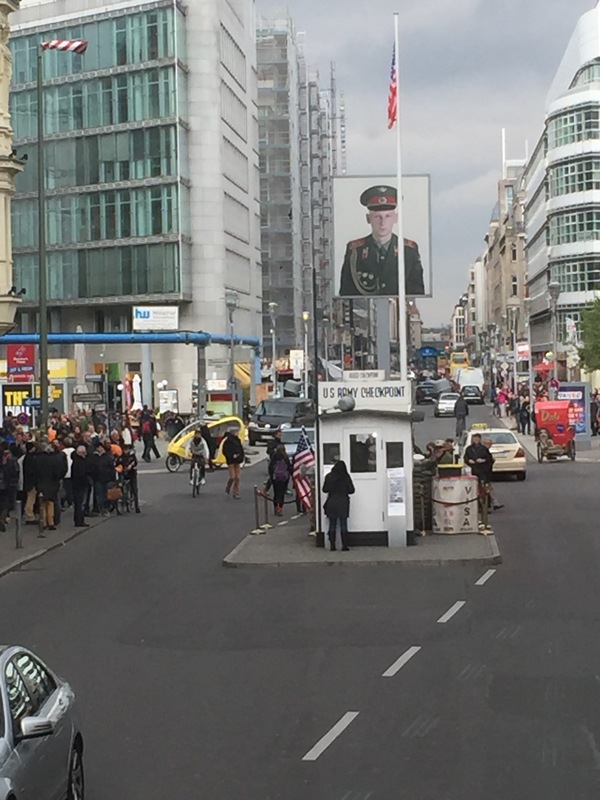 Following our tour of the memorial and visitors center, we hopped back on the bus and continued our tour through the streets of Berlin. 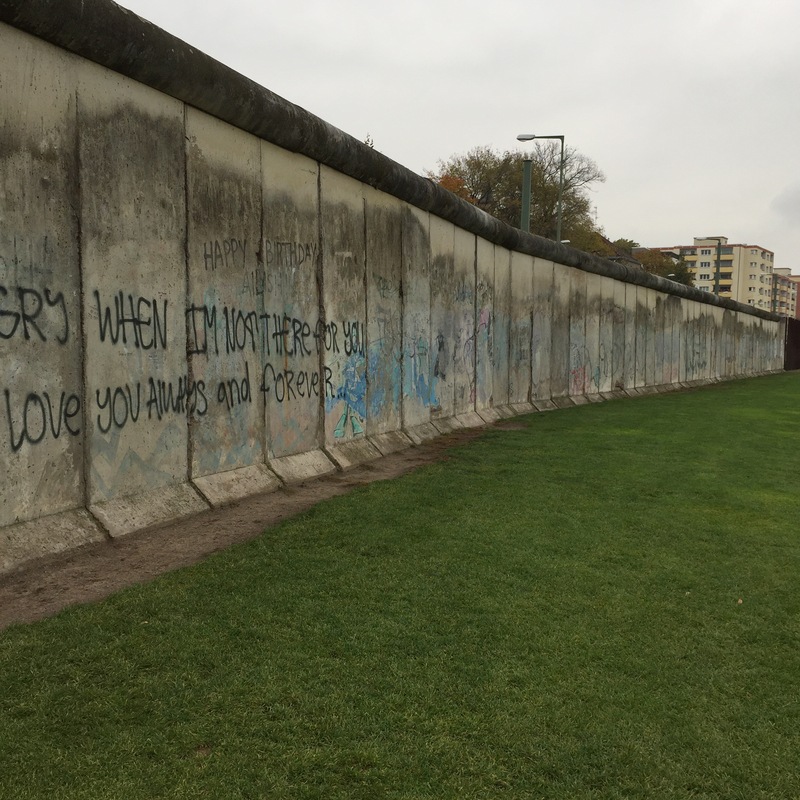 The impact of the division was obviously much more than just the wall. Driving through the east side of Berlin, the remnants of the communist impact are still visible—especially the big, pre-fab apartment buildings. 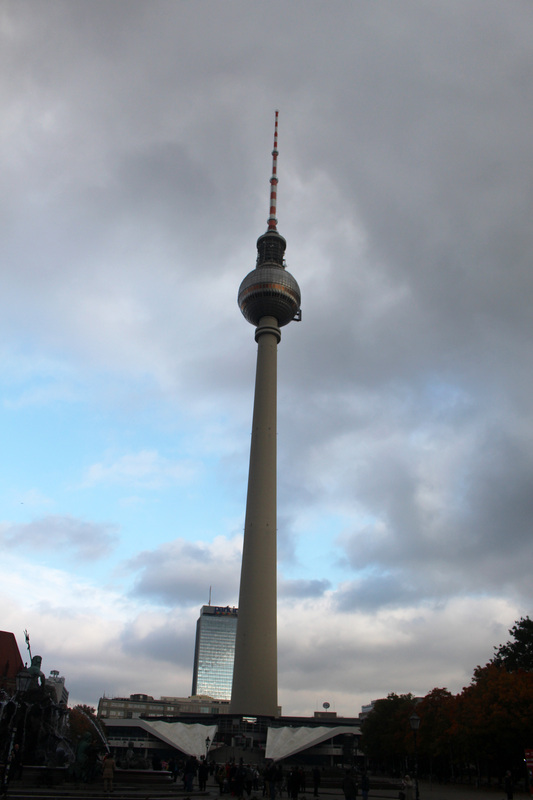 The Berlin TV Tower (a.k.a. Fernsehturm). 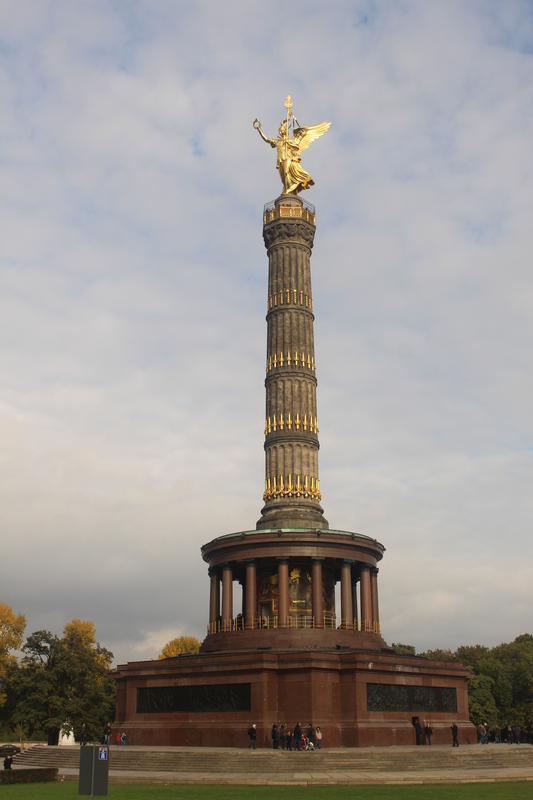 I hesitate to say Berlin is a particularly beautiful city, though there are definitely pretty areas. There are many areas that seem to still be recovering from the years of division following the war. 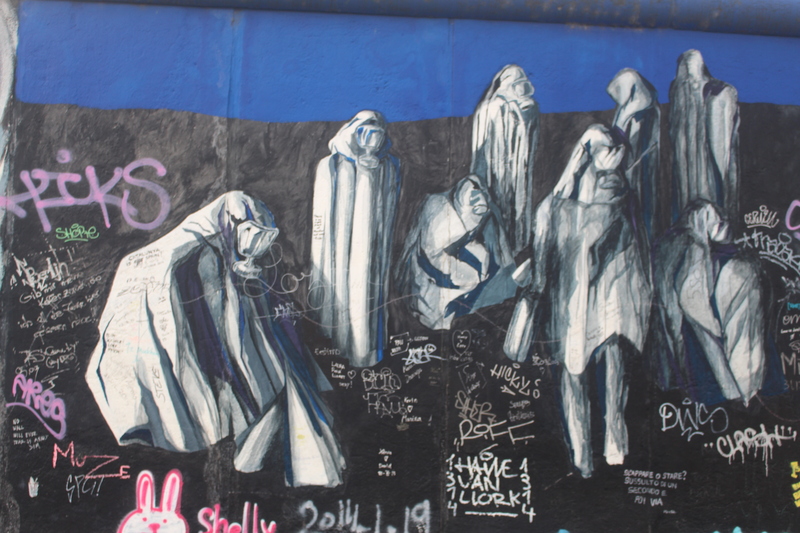 It does, however, make modern history and the impact of war pretty visible. 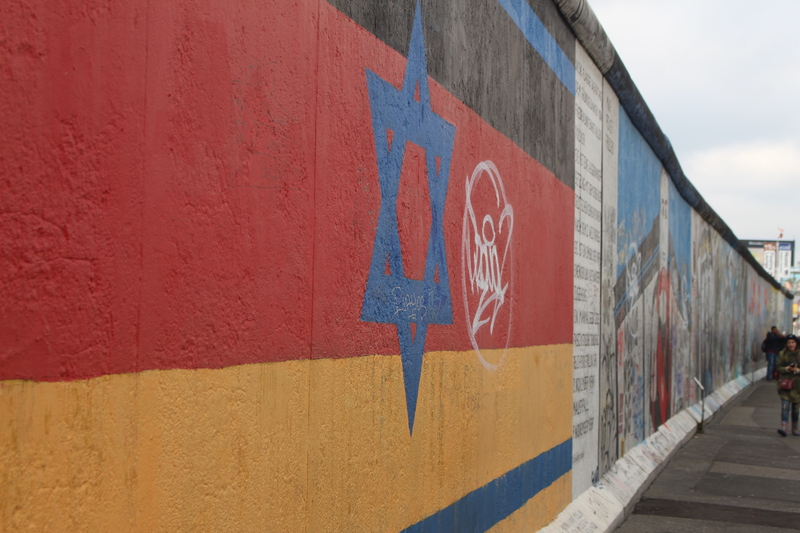 The East Side Gallery is a 1.3 km stretch of wall that was preserved as a memorial for freedom. It is covered in paintings from artists from all around the world and is reportedly the largest open air gallery in the world. There are also a few remnants of pre-war buildings that somehow remained standing, though were never restored after they suffered damage from bombs during WWII. 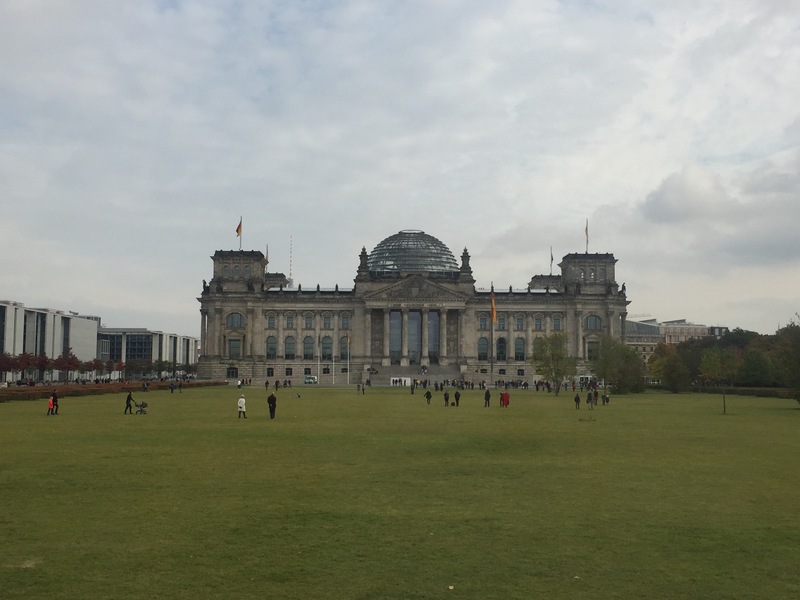 Berlin does have some stunning government buildings, including the Reichstag Building where you can hike up to the rotunda at the top and look down upon the lawmakers. There are also some pretty, sprawling parks nearby. We couldn’t miss stopping off at the Brandenberg Gate (Brandenburger Tor) of course. 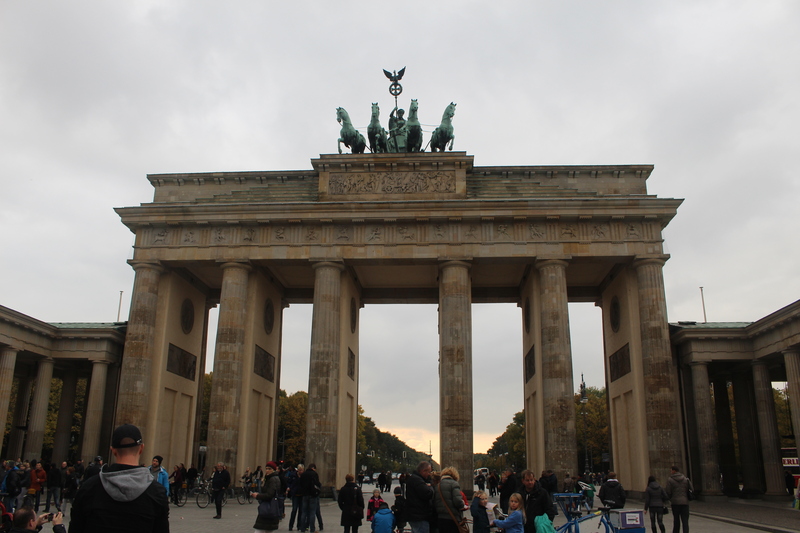 One of the best-known landmarks in Germany, the Brandenberg Gate is a neoclassical triumphal arch that was built on the site of a former city gate that marked the start of the road from Berlin to the town of Brandenburg an der Havel (according to Wikipedia). 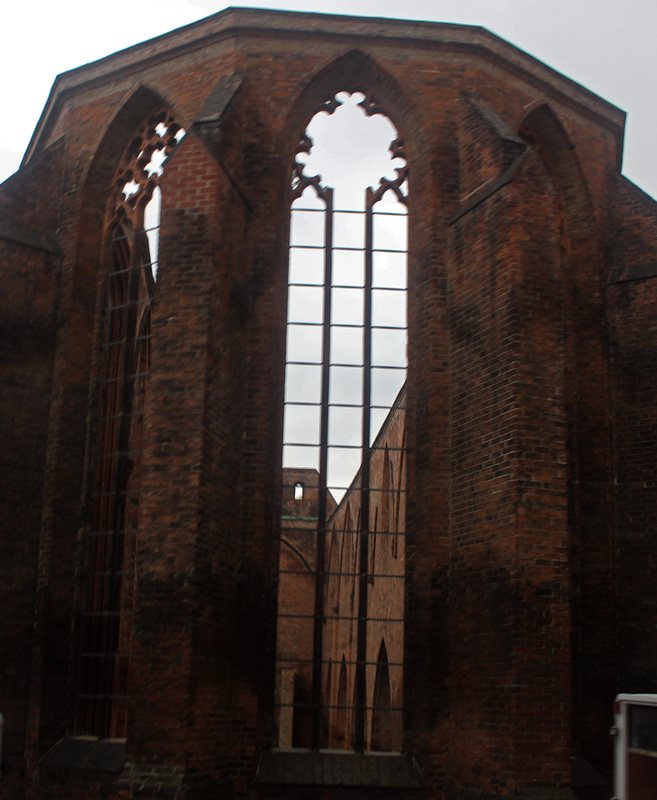 It has been a site for many major historical events. 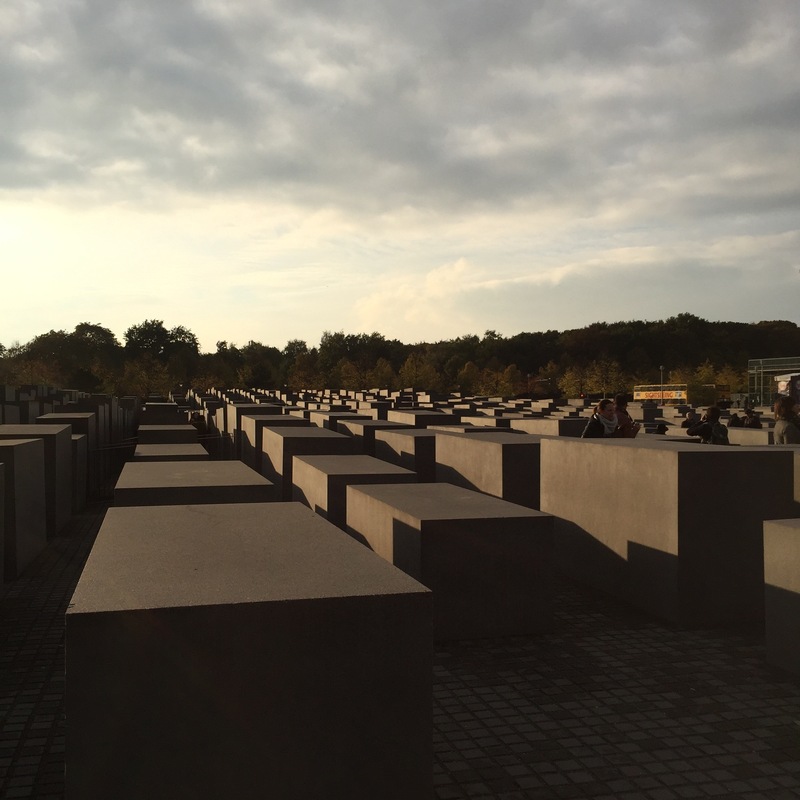 We ended our tour at the Memorial to the Murdered Jews of Europe. It was certainly striking, though perhaps not quite as solemn as we expected. Adults moved through the memorial snapping selfies while children darted in and out of the grey structures playing hide and seek. The museum beneath was very well done and provided a stark reminder of the atrocities of the Holocaust. Though the stories told and shared there were just a small glimpse into the lives of the millions who died, they provide a reminder of what can happen when the world turns a blind eye. We ended the day in Berlin at a German chain restaurant. It may not have been the best food, but it had a salad bar, so I was sold. After several days of sausage, all I wanted was some vegetables. This was actually lunch, not dinner. Currywurst. Apparently it’s the thing to eat in Berlin. We headed back to the train station after dinner and soon learned a very valuable lesson about the seats in German trains. If the little sign above the seat near the numbers is lit up, chances are that seat is reserved. We learned that the hard way, but luckily the person who’s seat we accidentally took was very gracious about it. And that was Berlin! A whirlwind trip, but very educational and fun. Bis später! Even though everyone raves about currywurst, I prefer the bockwurst! I’ll have to put bockwurst on my list for next time. Don’t think we tried it. 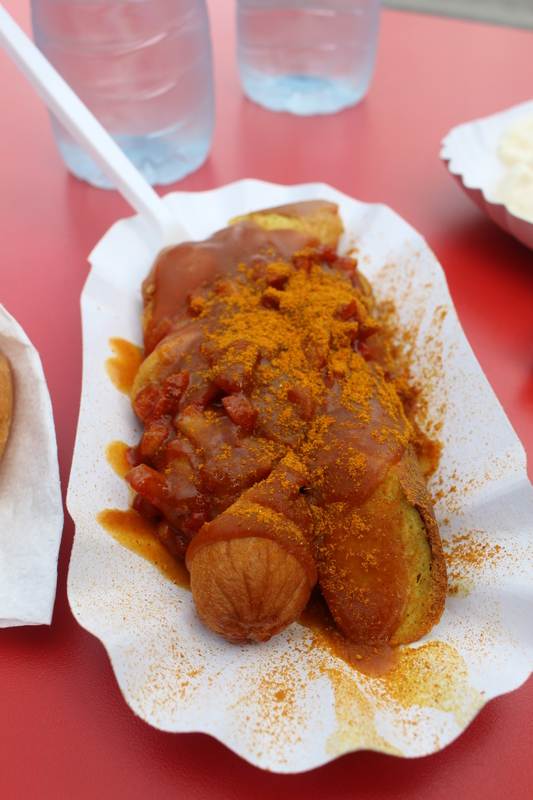 The currywurst was interesting, but I can’t say it was my favorite either. 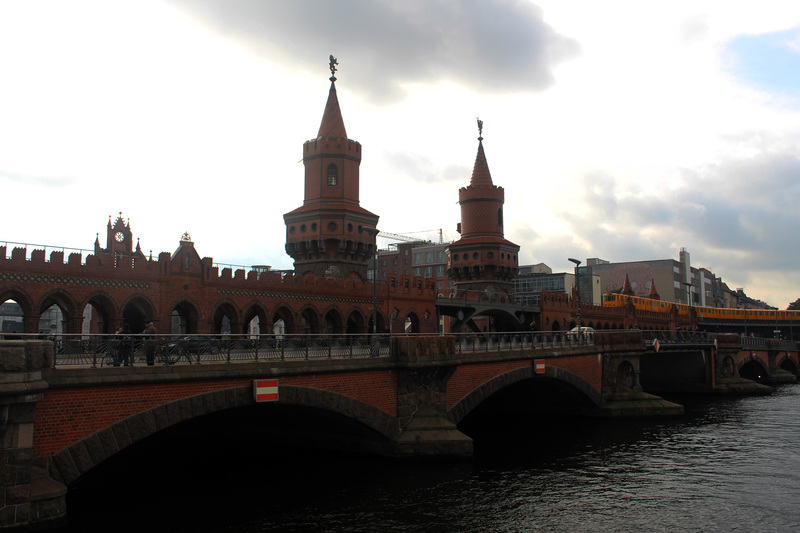 Probably my favorite city in Europe….that I’ve seen so far. 🙂 What an awesome day trip!